Having a gas barbecue is brilliant - we've used it three times in the space of a week! We had four friends over on Saturday for a barbecue and as I didn't have much time, and we weren't a big group, I didn't want to go all out with the salads and side dishes. But at the same time I wanted to provide a couple of home-made things and wondered if there was anything I could make beginning with O that would fit this month's Alphabakes theme. I decided that bread would be good to serve at a barbecue and that there must be something I could make using olives; a quick Google search found this recipe on Taste.com for olive and rosemary focaccia. It was very easy to make, though I don't know how they got the perfectly round shape; I had trouble stretching mine evenly but I think that just makes it look more rustic! I had an open jar of green olives in the fridge I wanted to use up so I used those instead of the black olives recommended in the recipe and it still worked really well. In the pictures below you can see how the yeast bubbles when the water is added, and how much the dough swells up. I used my Kitchenaid to knead it rather than doing it by hand. I used rosemary from my garden - about the only useful thing the previous owners of our house left us, in the shape of my herb patch! It was easy to slice and had a very good crumb, and tasted delicious dipped in a little oil and balsamic vinegar. It went very well alongside the salad at the barbecue. 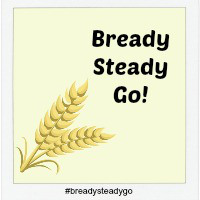 I'm sharing this with Alphabakes, the blog challenge I co-host with Ros of The More Than Occasional Baker, as the letter I have chosen this month is O.
I'm also sending this to Bready Steady Go, hosted by Jen at Jen's Food and Michelle at Utterly Scrummy. 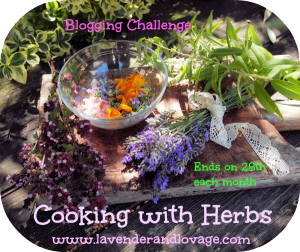 And with Cooking with Herbs hosted by Karen at Lavender and Lovage. We've been having lots of bbqs too but I've not managed to make anything for them, just cooked stuff on the bbq. This looks great and it's been on my to bake list for ages. yum!